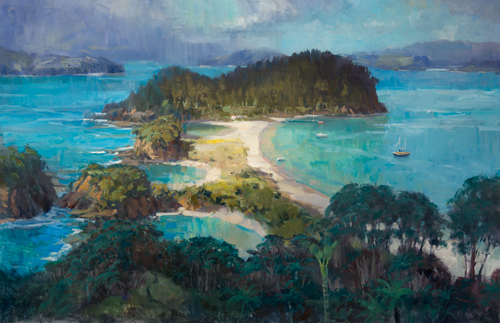 Artist Richard Robinson brought in this marvelous painting of Robinton Island, Bay Of Islands, New Zealand, to be copied and reproduced. Measuring over 1500mm x 1000mm this would be a challenge to copy. I photographed the image in 16 sections, stitched them together then colour proofed the image before making a full size canvas replica print. Richard was thrilled with the results. This entry was posted in Restoration Work by Photo Enhancements. Bookmark the permalink.